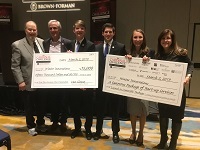 Lia Winter and her team captured the top prize and $15,000 in this past weekend’s annual “Brown-Forman Cardinal Challenge” hosted by the University of Louisville. She pitched the EasyWhipTM device used for orthopedic reconstruction procedures like ACL (anterior cruciate ligament) surgery. The team also won the “Launch in Louisville” package which includes over $100,000 in in-kind prizes if it launches the business in Louisville. The competition included a preliminary round, where EasyWhipTM took first place among its track competitors, and the finale. “The question session for the final round was one of the toughest that we’ve experienced in a pitch competition thus far, and the judges really challenged us to dig deep into our go-to-market strategy and financials,” Winter said. Joining the UT, Knoxville (UTK) graduate student for the presentation were Ryan Cunningham, a UTK senior and the company’s Director of Marketing; Preston Dishner, a fellow graduate student and Director of Operations; and Lynn Youngs, Executive Director of the Anderson Center for Entrepreneurship and Innovation in UTK’s Haslam College of Business and Faculty Advisor to the team. Winter and the team hit the road again this upcoming weekend for the “Stu Clark Investment Competition” at the University of Manitoba in Winnipeg. For more information on the student entrepreneur and the two competitions, read our recent teknovation.biz article here. Pictured are the presentation of the checks are (left to right) Van Clouse, Director of the University of Louisville Forcht Center for Entrepreneurship; Youngs; Cunningham; Dishner; Winter; and Suzanne Bergmeister, Assistant Director and Entrepreneur-in-Residence at the Forcht Center.